As an independent business owner, you likely don’t have the time or money to spend on extensive marketing campaigns and advertising. 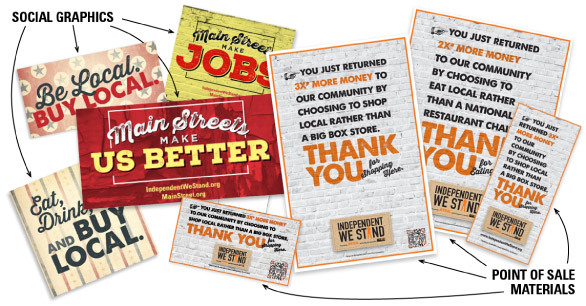 Therefore, one of the easiest way to get noticed by customers – without dishing out massive marketing dollars – is by becoming a member of Independent We Stand. When you’re an Independent We Stand basic member, your business is listed on our ‘locals only’ search engine and on our iPhone and Android mobile apps, so consumers can find you on the go, at home and at work. In addition, you have exclusive access to a variety of marketing resources including everything from – point of sale materials – to social media graphics and more, for your business. Log in below to gain access to these materials. Don’t have an Independent We Stand membership? Sign up for your FREE membership by clicking here. Forgot your password? Email us at info@independentwestand.org.